(Richard) Kevin Winkle, M.D., grew up in Seattle. He attended the United States Military Academy at West Point where he graduated with honors in the academic top 5 percent of his class. He spent six weeks of his summer military training in 1985 at Fort Greeley, Alaska, at the Northern Warfare Training School when he fell in love with the great state of Alaska. He spent the summer of his senior year at the Academy in the Gambia,West Africa, as part of Operations Crossroads Africa, a summer long Peace Corps-like mission, where he met and fell in love with his wife, Kathy. Following graduation from West Point he attended the Uniformed Services University of the Health Sciences in Bethesda, Maryland, where he was selected into Alpha Omega Alpha, the National Honor Medical Society, and he was given the highest award for Pediatrics in his class. Dr. Winkle graduated from medical school in 1991 and started his medical career in Pediatrics and completed a categorical Pediatric internship at Madigan Army Medical Center in Tacoma, Washington, en route to his residency in Ophthalmology. Between his internship and residency, he spent two years performing general medicine as a U.S. Army flight surgeon at Fort Wainwright, Alaska, where his love for Alaska blossomed. It has been his home ever since, even though he was stationed away for many years. Dr. Winkle returned to Alaska following his residency, where he practiced comprehensive Ophthalmology at the VA here in Anchorage as well as at the Alaska Native Medical Center as part of the Federal Healthcare Partnership. In the late ‘90s, he served as a Pediatric Ophthalmology Fellow at the Duke University Medical Center in Durham, North Carolina, where he trained in Pediatric Ophthalmology and adult Strabismus, Pediatric Glaucoma, and Neuro-Ophthalmology as part of the fellowship. He then spent seven years on the island of Oahu, Hawaii, where he started the Pediatric Ophthalmology service at Tripler Army Medical Center and was the chief of Ophthalmology for his last five years. During his time away from Alaska, he still came back once or twice a year and performed specialty clinics at the Alaska Native Medical Center and might have been found on one or two local rivers on the weekends. After a tour in Iraq in 2006-2007, he spent two years in Colorado prior to returning to Alaska in 2009 in order to start a Joint Army-Air Force Refractive Surgery program at JBER. During that time he also performed Pediatric Ophthalmology clinics and surgeries at the Alaska Native Medical Center. When he retired from the Army in 2012, he joined the staff at the Alaska Native Medical Center full time. Just prior to starting at the Alaska Native Medical Center, and while actually fishing the Kenai, Dr. Bob Arnold called him and planted the seed for Alaska Children’s Eye and Strabismus — creating a joint Pediatric Ophthalmology practice for the three doctors in Alaska who are Pediatric subspecialists. The rest is modern history. Dr. Kevin’s true passion is children and their vision, but he also continues to practice his skills caring for adults, too. He continues to perform state-of-the-art cataract procedures, oculo-plastic surgery and glaucoma surgery on adults. He feels that keeping those varied skills at the top of his game makes him that much better when caring for similar issues in young children. 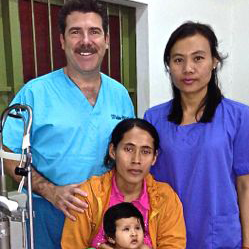 Dr. Kevin also has a passion for overseas surgical missions. He has performed over fifteen surgical missions in Central America, the Caribbean, Southeast and Southwest Asia, Japan, Africa and the Pacific Islands, operating on both children and adults. Being able to continue these trips was a key part in wanting to make Alaska Children’s Eye become a reality. He currently makes at least yearly trips to Cambodia where he performs specialized surgeries and teaches local Khmer physicians. Besides his passion for children’s eyes, Dr Kevin enjoys woodworking and loves to fly fish the Kenai River with his three ladies. Kathy, his wife, loves to cook, never seems to mind being on the river and is awesome with a fly rod. Kate, his eldest, graduated from Colorado State University with Honors and was a news producer at KTUU here in Anchorage before moving to Texas. Kelsea, his youngest, is studying at Colorado State University and hopes to one day work in public relations with the Seattle Seahawks.